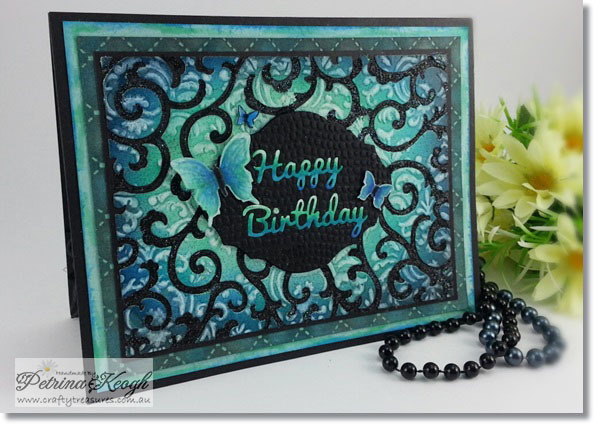 Hi Crafty friends, for today’s projects I will be showing a few cards I had fun making a while ago utilizing the Sizzix Thinlits – Frame, Iron Gate Die. These photo’s really don’t do these cards justice, the holographic sparkle and also the glitter is just gorgeous. I thought I would group these cards together seen as they were all using the same die design. This is one of my favourites, if you don’t like bright and colourful… look away now or grab your sunnies, because this one screams colour, and a rainbow of colours at that. I used some adhesive rainbow sticker sheet I have had laying in my sticker draw for eons! 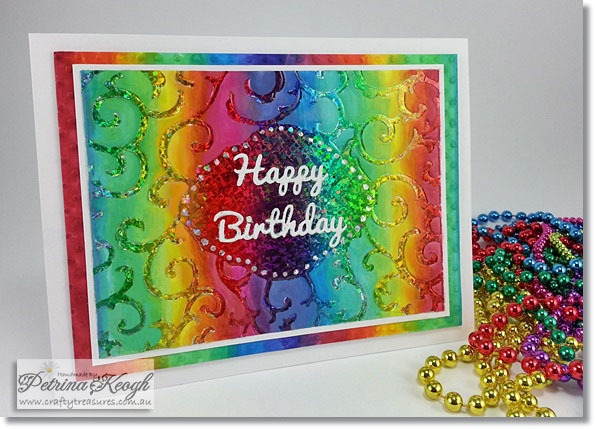 Most people would probably think this card is very involved to make, but it is a relatively easy card, it’s just coloring, blending (the blending would be the hardest part) and 2 die cuts and that’s it… but doesn’t this card really pack a punch of colour! I do have a few more ideas on the my desk, but I have not quite finished them yet, I will share them with you when they are finished! The background was coloured with copic markers and blended to coordinate with the colours of the sticker sheet. The back panel was also coloured and blended with copic markers and dry embossed with the dots embossing folder. Did you know the Copic Colourless Blender Ink will take the colour off the coloured holographic sticker sheet? Using pointed cotton tip, I drew some dots with the copic colourless blender ink all the way around the central part of the Iron Gate design. 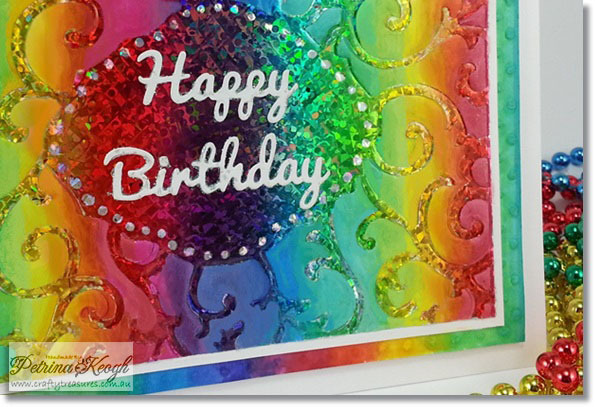 I also used some crystal glitter on the Happy Birthday wording. It felt like not long ago we needed lots warmth, but I could do with some of that snow right now, I can handle dry heat but it’s the humidity I don’t like! I coloured up a Mo Manning digital image – Nose to Nose with copic markers, aren’t they so sweet. I had this image previously coloured and kept aside in a folder. I like to grab the folder now and then, when I feel inclined and have time to just sit and colour. I keep a folder for uncoloured images and another for coloured images. I like the triple textured look of this main panel with the La Carta textured cardstock, the embossed crackle and the Iron Gate to top it off! I had some JAC paper stored away, so I die cut a piece of JAC paper with the Sizzix die and adhered it to the embossed & textured cardstock, peeled the top layer of the JAC paper and applied some glitter, I still was not happy with the end result so I coloured straight over the JAC paper and glitter with two different copic markers shades. I thought the glitter may have shifted a bit as I worked over the top of it, but it did not budge (I was fairly light handed) and it colours up fine. Oops forgot to mention that I die cut the middle with a oval die. I have heard many crafty stampers choose there designer papers first and then coordinate their copic colours and image to suit their chosen papers, I guess I’m a back to front Gal… I chose the image first from my folder and chose the cardstock and other coordinating colours to match the image. It really doesn’t matter which way you do it, which ever works for you, the only difference with starting with the papers first is you can closely match the markers or colours to the designer paper or cardstock you wish to use, followed with the image, should all relatively match. Or you could just go with the latest fashions and go colour clash! This was probably more involved than the other three, don’t try this one at home! Only joking, this one I basically used the scrap pieces the were leftover after cutting the frame – Iron Gate die for another project with white cardstock. 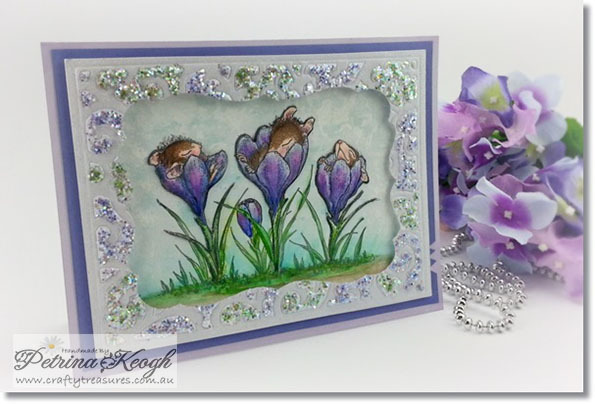 The scrap pieces were dry embossed with the Jamara embossing folder and air brushed with 3-4 shades of copic markers. After adhering the airbrushed pieces to a black panel, I adhered some black glitter to the black exposed parts of the design. 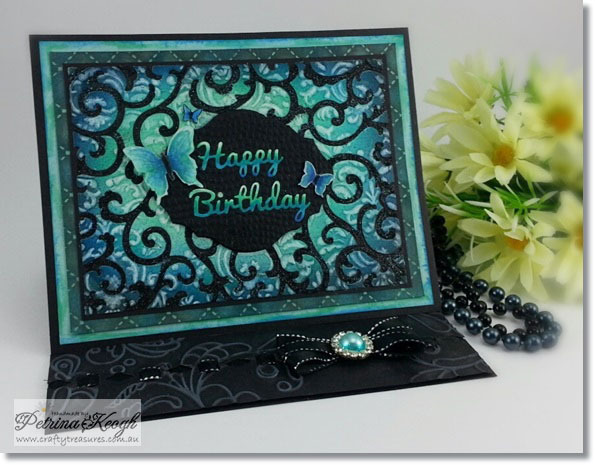 I had some butterflies already cut from the Butterfly Frenzy die, so I coloured them up to match my card. 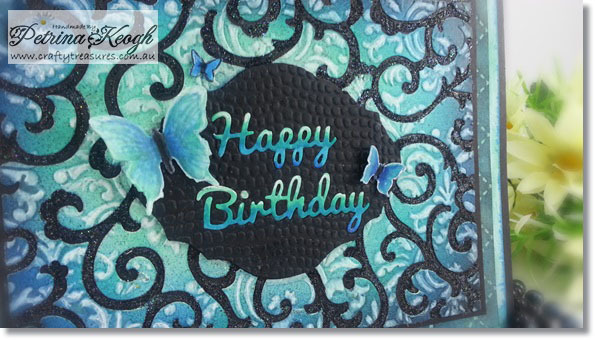 I cut another piece of just the central part of the Iron Gate die with a piece of black cardstock and then die cut that same piece with the happy birthday dies and then dry embossed this the mesh embossing folder. I also die cut the happy birthday dies with a separate piece of white cardstock and coloured them both with copic markers and inlaid them into the embossed black panel (I adhered a piece of scrap paper on the back for the wording). I used some 3D foam adhesive to mount this panel in the middle on top of the previous center design. The easel stop I embossed with Elegant Lines embossing folder and die cut with Spelbinders – Edgeabilities/(Insert A). I found some stunning holographic edged ribbon in my stash so I weaved it through, made a bow and embellished the bow with a pearl diamante and coloured it with a matching copic marker shade. They look so comfy all snuggled up asleep… make room for me guys, I need it after writing all of this… I buzz the unopened bloom at the back! 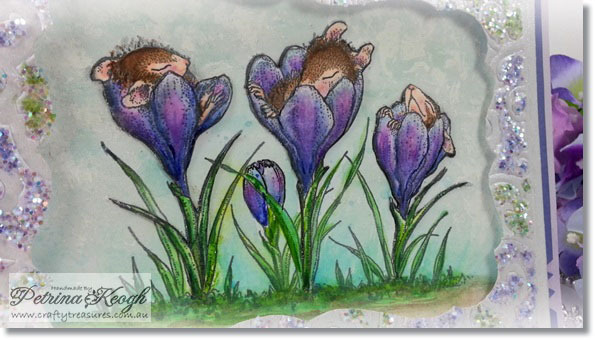 I cut an aperture in the card front with a Spellbinders – Labels Seventeen die and then dry embossed the same panel with the Sizzix – Iron Gate die for this adorable House Mouse image – Sleeping In Crocus. The image was coloured with watercolors and copic markers and the clouds were sponged with some white acrylic paint. I added some chunky glitter to parts of the design with diamond glaze. The image itself is partly 3D’d with a 2nd image stamped and coloured the same as the first image, shaped gently and adhered with silicon. The aperture frame was adhered to the base frame with 3D foam adhesive. On the right hand side, I snipped a couple small notches. In The Garden with Cats! 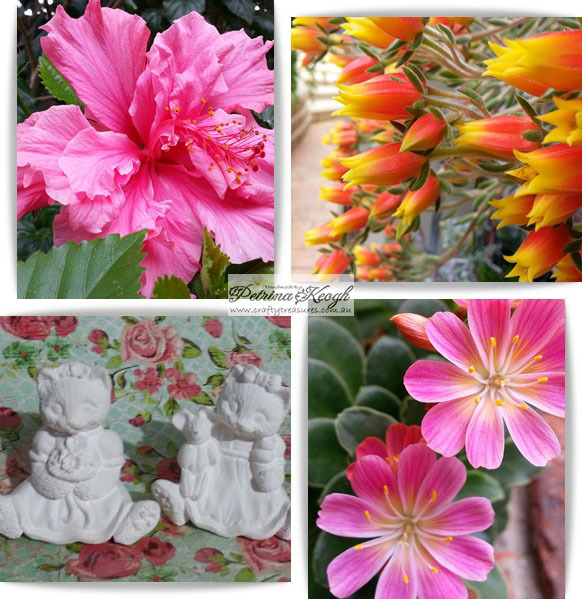 While there are flowers flowering and birds singing, I just couldn’t resist sharing a few photo’s I took from our garden and also tell about a very surprising find.. these two ceramic cats which are in need some colour aren’t they! I nearly fell over backwards when I found these amongst some bits and bobs in the spare room, and I thought I had finally finished them all… no such luck! The cat on the right is holding her mouse doll while enjoying a double scooped ice cream…. yummy!, and the cat on the left is holding a lovely posy of flowers. Here are all the other ceramic cats I painted, just in case you missed them.